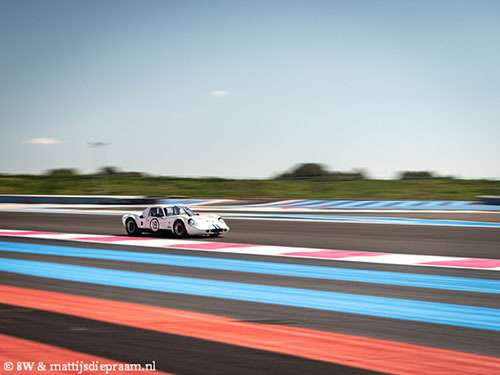 Masters Historic Racing and the guesting Dutch Historic Touring Car & GT Championship kicked off their 2019 in the south of France in a meeting hosted by French organisers HVM Racing. Called the Le Castellet Motors Cup, the two-day meeting at Paul Ricard fully revolved around the five Masters grids, that managed to produce two double victors. A quality field of 20 Formula One cars came out for the opening round of the FIA Masters Historic Formula One Championship, and the difference with previous years was that there was no clear favourite – no Michael Lyons and no Nick Padmore to dominate proceedings, so it was all to play for. At least five drivers looked like a good bet for the title, with a few dark horses added into the mix. In the end, though, it was young Italian Matteo Ferrer who took two comfortable wins in his Ligier JS11/15, leaving rivals such as Mike Cantillon (Williams FW07C) and Christophe d’Ansembourg (who had switched to a Brabham BT49) scratching their heads. Joaquin Folch, even though he was never going to do the full season in his BT49, was equally soundly beaten, while the only man getting close to Ferrer in qualifying and in the first race was the surprising Jamie Constable who was very much on the pace in his Tyrrell 011. Later in the season, perhaps Steve Hartley in his newly acquired McLaren MP4/1 could also be challenging for podiums, as could Charlie Nearburg in the Williams FW07C previously raced by Padmore. Behind Ferrer, Constable and d’Ansembourg claimed the remaining podium spots on Saturday, while Cantillon fought back on Sunday, rubbing Constable of another second place. In the pre-78 class, champion Greg Thornton and his perennial rival Max Smith-Hilliard had both decided against returning. This left Henry Fletcher without any competition capable of truly challenging him, and the March 761 driver indeed rattled off an easy win in the first race, comfortably driving among the post-78 cars. When he ran into trouble in the second race, the second and third-placed drivers of Saturday moved up a place to take the win and second place. Behind Patrick d’Aubréby (March 761) and Jason Wright (Shadow DN8), Philippe Bonny’s Trojan T103. 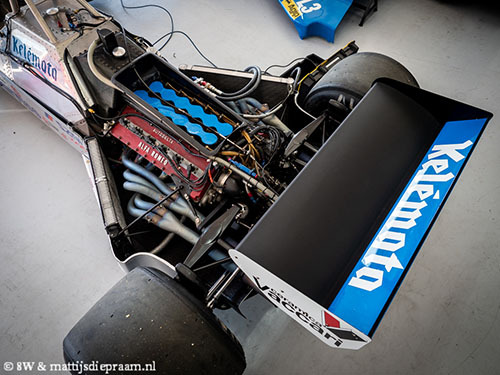 Meanwhile, Mark Hazell in his new Williams FW08 could pose a title threat if he keeps his post-83-class Williams FW08 running in the presence of class competition such as Georg Hallau’s Theodore N183 and that wonderful new addition to the championship – Richard Hope’s Alfa Romeo-powered Osella FA1E. In the FIA Masters Historic Sports Car race, Fletcher made amends for his failing F1 March by dominating in his new Chevron-Cosworth B26 that he would also take out at Barcelona on the following weekend for Peter Auto. 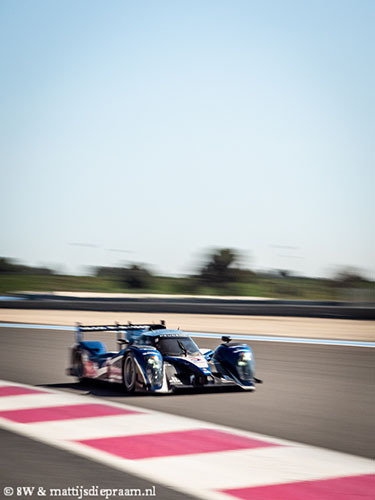 Competition would have come from the Ligier-Cosworth JS2 shared by ‘Mr John of B’ and Soheil Ayari but when the Ligier was left stuck in gear during the driver change, the quick Ayari failed to complete a single yard. This handed second place to the Lola-Chevrolet T70 Mk3B of Jason Wright, now shared with its preparer Andy Wolfe. Wolfe struggled with lack of third gear and was unable to make an impression on Fletcher. Third would have gone to Charles Nearburg’s Osella-Abarth PA1 but the tall Texan was forced into a dramatic stop on the final tour, handing the final podium spot to the Lola-Cosworth T212 of Gonçalo Gomes and James Claridge. In the pre-66 Hulme class, Chris Jolly and Steve Farthing (Cooper Monaco T61M) got one up on their usual opposition of Keith Ahlers/Billy Bellinger (Cooper Monaco King Cobra), reigning champion Ahlers admitting to not quite gelling with the Paul Ricard track. The two races with the slightly more modern sportscar machinery proved to be real crackers, Kriton Lendoudis (Peugeot 908 HDi FAP), Christophe d’Ansembourg (Lola-Aston Martin DBR1-2) and Steve Tandy (Lola-Mazda B12/60) turning their fight for the Masters Endurance Legends podium places into two veritable thrillers. Lendoudis won on Saturday, d’Ansembourg prevailed on Sunday. Darius Ahrabian (Lola-Lotus LMP2 Coupé) took two easy LMP2 wins while Nikolaus Ditting capped two GT wins in his Aston Martin DBR9. Julian Thomas and Calum Lockie dominated both the Masters Gentlemen Drivers and Masters Pre-66 Touring Car races. Thomas did have to fight it during his opening stint in the touring-car race, relishing the slipstream battles with Jake Hill’s down-on-power Mustang (which later would drop out in the hands of Rob Fenn) and Jason Minshaw in another Ford Falcon. With Minshaw’s team mate Martin Melling unable to keep pace with Calum Lockie, the Thomas/Lockie Falcon had an easy time of it towards the chequered flag. Roel Korsten was the star of the Dutch race-within-a-race, storming up to second place overall in his Mustang, ahead of the Mark Martin/Steve Soper Lotus Cortina. Thomas and Lockie were in a class of their own in the Gent Drivers race, their freshly delivered Shelby Cobra Daytona Coupé winning by a full lap from the Jake Hill/Rob Fenn Lotus Elan and Ron Maydon’s Ginetta G4R. Hill and Fenn felt sorry for Elan rival Aaron Head dropping away right at the end and losing second place in the process. The C2 class was won by Nils-Fredrik Nyblaeus and Jeremy Welch in their Austin Healey 3000. They beat Keith Ahlers and Billy Bellinger who showed up with their backup Morgan Plus 4 Super Sports, their SLR still their panel beater’s workshop after the sizeable accident at Estoril last year.